Bible - the basis of Christian civilization - and will determine the nature and direction of spiritual development, mentality and identity of many peoples of the world. We can say that human self-understanding is directly related to the study of the Holy Scriptures of the Old and New Testaments. The monastery is built building for the Museum of the Bible and the complete interior decoration exhibition halls. The funds of the temporary storage, there are about 400 exhibits. Funds of the museum is a unique collection of literary works, which reveals the fundamental role of Scripture in world history and culture. 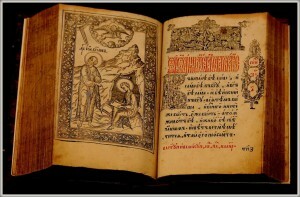 This facsimile edition of the earliest and most famous books of Scripture (Assemanievo Ostrom Gospel and the X-XI centuries., And Svyatoslav Collection 1073), and the original copies of the Bible, starting with the famous first complete Slavic-Russian edition, printed by Ivan Fedorov in 1581 by means of Prince K.K.Ostrozhskogo. The collection also presented the first edition of the Bible in Russian, as well as over one hundred publications and selected texts of the Bible books of Scripture XVII-XXI centuries. Significant value are the Moscow edition of the Gospel, 1618, 1648, famous for its luxurious design edition in 1681, the Apostle in 1630, published in the Kyiv-Pechersk Lavra, and more. The funds of the many well-known stores and albums illustrated Bible illustrations for the biblical texts. Including: the Bible with illustrations by Gustave Dore, a rare album of drawings of biblical themes Dali, Milanese illustrated edition of the Bible in seven volumes, illustrated edition of "The Bible of the Moscow Patriarchate to the millennium of Christianity in Russia," and dozens of other illustrated texts of Scripture, as well as albums paintings, frescoes and sculptures of biblical themes. There are editions of biblical books in many languages ​​of the peoples of Russia, facsimile editions of the Bible in the language of the peoples of the world, children and family Bible, a lot of reference and encyclopaedias, etc. Having a decent collection and space for opening of the exposition, the monastery needs funds to replenish the funds, making the necessary display equipment, booths, modern demonstration funds.